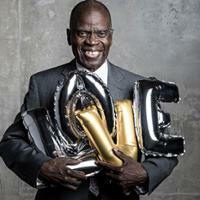 Legendary saxophonist Maceo Parker has been a common thread in the history of funk — helping to pioneer the sound of the genre in collaborations alongside seminal icons such as James Brown, George Clinton, and Prince, all the while honing his own signature brand of showmanship with a cool confidence. In this special program, Maceo, along with his flawlessly tight Big Band — former members of the Ray Charles Orchestra and the Raelettes — bring together a joyful experience of all things LOVE. Anchored in music from his new album It’s All About Love (including hits from Crosby, Stills & Nash, Major Harris, Stevie Wonder, and the Isley Brothers including “Love The One You’re With,” “Love Won’t Let Me Wait,” “Isn’t She Lovely,” and “I Love You A Bushel And A Peck”), and Ray Charles material featuring each of the Raelettes, along with Maceo Parker classics such as “Soul Power” and “Pass the Peas,” it’s sure to be an evening that transports audiences to the slickest of eras in a performance that is positively timeless. Join the Modlin Center for the Arts as we celebrate the closing of our 2018-2019 season with a post-performance reception in Booth Lobby.